This past week we had our first book club meeting of the Lent Term. 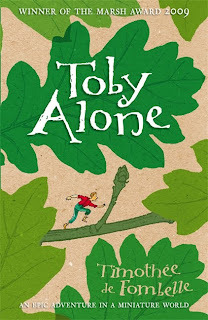 We discussed Toby Alone by Timothée de Fombelle. Originally written in French, this is the charming (or magical, if you consider 'charming' a negative adjective) tale of a boy less than a millimeter tall who is trying to escape with his life and that of his parents, whilst navigating the tree that he and the other tiny people call their home. The layout of the tale, particularly the author's utilisation of flashbacks throughout, made for a unique read. However, we all agreed that the plot continued at an action-packed pace even with the backward glances. There were points of frustration with the book. Some were concerned about the didactic undertones, spotting both environmentalism and the threat of a dictatorship embedded not so subtly within the text. Others, myself included, were frustrated to find that the book was not a stand-alone text. Though most knew it had a sequel, the cliff-hanger of an ending left a few of us wanting to throw our copies across the room. Overall, the general conclusion was that this book is certainly worth the read. Just remember that it is one in a set of two, just in case you are trying to avoid making yet another book-shaped scuff on the wall.